The situation with mama-tomo is that mothers with children will have to interact with other mothers when they pick up their children from school, or when they meet the teachers to follow up on their children’s performance. These mothers then form friendships, have regular gatherings and confide in one another the ups and downs of child-rearing, as well as receive support during tough times. However, competition between these mothers underlie their friendship, and things can become rough when conflicts arise. Furthermore, more than half of the mothers surveyed (53.0%) said that friendship between mothers was exhausting. Why is this so? Hence, this intricate yet delicate relationship between mothers has gained attention in recent times, where popular culture tries to unravel the mystery of mama-tomo. The TV drama series Desperate Motherhood / 名前をなくした女神 (which literally means “The Goddess Who Lost Her Name”), depicts the lives of five mothers who face challenges within the mama-tomo community. Why the unusual title? Mothers in Japan seldom call each other by their names. Instead, they are often referred to as -insert child’s name-‘s mama. For example, Terry’s mother would be called Terry-kun mama (テリ―君ママ, Terry’s mama). For those who prefer to read, Matano Nao drew Mamatomo no Okite, Honne & Sadame (ママ友のオキテ、ホンネ、サダメ) based on her personal experience as a mother of 15 years, and observations of mama-tomo around her. This light-hearted series deals with the competitive spirit that mamatomo hide behind their sparkly smiles! So, how exactly should mamatomo interact with one another? Would you follow these advice? 1. Mamatomo are NOT your friends. not to treat such feelings as friendship like you felt back in your school days towards other mamatomo. 2. Socialising with mamatomo is a form of society training. such that you would have to continue socialising with her even under such circumstances. 3. It is better not to just live in a world of mamatomo. thought of as serious instead. It is advisable to be in contact with your interests and other people as well. Are mothers in other countries facing the same situation? 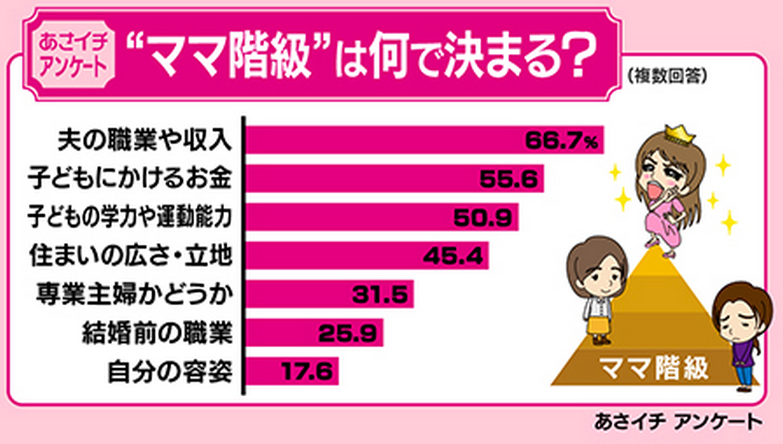 What are some differences in relationships between mothers worldwide vs. those in Japan? What advice would you give to these mothers?